Himalayan Vulture (Gyps himalayensis). 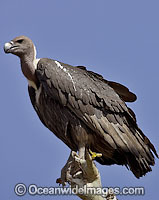 Also known as Himalayan Griffon Vulture. Breeds in the mountains of the Himalayas and Tibet. Listed on the IUCN Red List of Threatened Species.